Nara is the capital city of Nara prefecture, located close to Kyoto in the Kansai region. 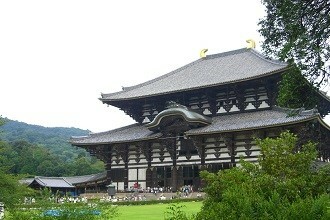 One of the most popular attractions in Nara is Nara Park. Within Nara Park, many wild deer roam the grounds. People are encouraged to purchase small rice crackers for the deer. As you walk through Nara Park, you will be able to see Todai-ji. This temple has an iconic, giant Buddha statue. The statue was made in 855 and is 49 feet tall and weighs 500 tons. In the temple there are a lot of miniature replicas of the temple and grounds, as well as many Buddhist statues. Nara is famous for a special form of pickle called Narazuke. Narazuke refers to vegetables of the gourd family that are pickled in sake lees. In the past, it was only for the upper class. We can thank the Edo period for introducing it to the general public!